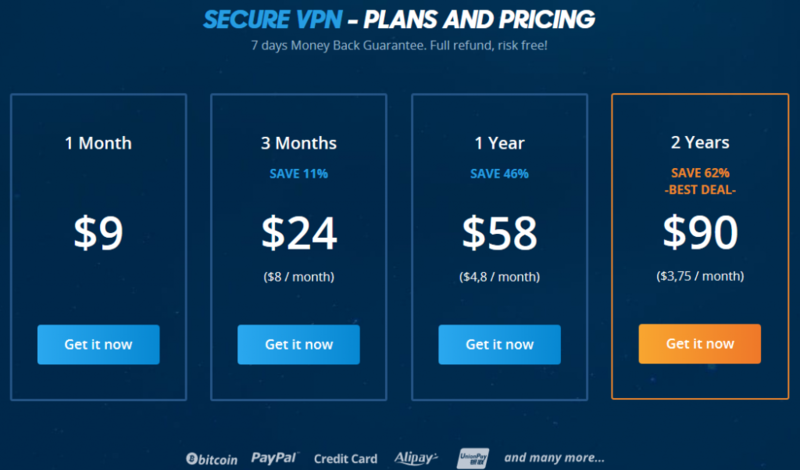 VPN.AC Review 2019 – Is It Useful? Have you heard of VPN.ac? Is VPN.AC reliable? Does VPN.AC work in China? Does it protect users’ privacy? These are the frequent questions asked by people and things to know before buying. VPN.AC is one of the advanced VPNs in the market. It has been trusted by a large number of users all over the world. Learn why it is so popular in this VPN.AC review. VPN.AC is a popular online privacy and security service owned by Netsec Interactive Solutions which is an IT security company established in Romania. According to the provider, each member of their team has over 14 years of experience in IT security. They are committed to providing private and security audit service for both public and private customers, banks and military institutions. This service helps users hide online activities and safeguard precious data sent over the Internet. IP addresses from different countries are provided and advanced encryption technology is used to give you the best browsing experience. Its global network enables you to access restricted content freely. VPN.AC is a useful and reliable security tool. VPN.AC offers an excellent service for a reasonable price. It provides flexible plans and you can select from 1-month, 3-month, 1-year or 2-year plans based on your need. The 1-month plan is $9 USD which is relatively cheap in the market. The 3-month plan is 11% off, it costs $24 USD for three months and only $8 USD per month. The 1-year plan is 46% off, you only need to spend $58 USD for the whole year and it is $4.8 USD per month. The best deal is the 2-year plan which is 62% off. It only costs $90 USD for 24 months and $3.75 USD per month. VPN.AC doesn’t offer free trial accounts, but all paid plans are covered by a 7-day full refund policy. You have 7 days to test the VPNs for free. If you are not satisfied with the service, you can request a refund. The provider allows you to pay with a wide range of payment processing systems, including PayPal, UnionPay, iDeal, WebMoney, and Alipay. If you want anonymity, you can pay with Bitcoin, or with gift cards. You can also pay via SEPA bank transfer. No matter which country you are living in, you will find the payment option you frequently use. If you have any question in signing up, you can contact the provider any time. VPN.AC is one of the most reliable VPN providers which helps you reclaim your privacy and browsing anonymity and protect your data effectively. Its team has gone the extra mile for ISO27001 and ISO9001 certifications with rich experience in security industry. These security certificates provide VPN.ac with an additional edge over the competition by ensuring that they are aware of the vulnerable areas in VPN infrastructure. To deliver the best secure network solution, it offers advanced encryption protocols, double-hop server configurations, and secure proxy browser extensions. With its protection, you are safe from hackers, private from snoopers and free from Internet restriction. Hackers can’t steal your precious data. Snoopers and ISPs won’t be able to track you because you are anonymous. VPN.AC allows you to access the global network freely by offering smart servers. 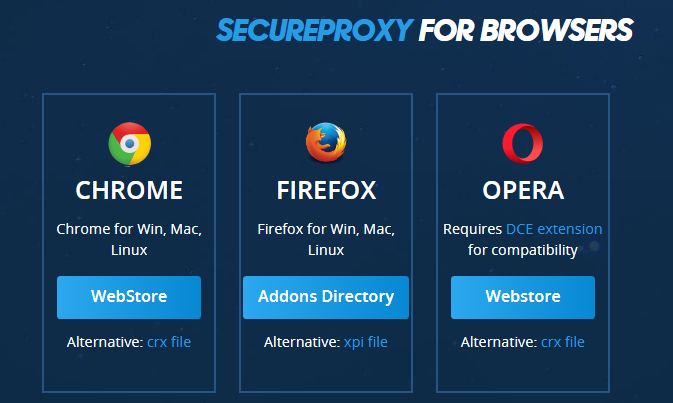 The free SecureProxy service is an extra feature and helps you get around geo-restriction easier. Its speeds are great even on long-range connections while the privacy and security specs are excellent. To ensure you can enjoy the benefits of this VPN thoroughly, they offer quality customer service. They are always ready to answer your questions and fix your issue. The reasonable price is another reason why it has been so popular. It starts from $3.75 USD per month. VPN.AC is surely secure. It utilizes military grade encryption to prevent others from accessing your data and keep you safe when using public Wi-Fi networks. AES 256-bit encryption and strong 4096-bit RSA session establishment encryption are used by this VPN. AES 256-bit encryption is the highest standard in VPN industry by now. The RSA encryption with a 4096-bit key offers very strong encryption. Only the most security-conscious VPNs are offering this this encryption right now. This is particularly important for those wanting a VPN in China and other similar countries where the authorities are rumored to be working on cracking the session establishment encryption of VPN systems. VPN.AC supports all major advanced protocols, including PPTP, L2TP/IPSec and OpenVPN. PPTP protocol is a pretty fast protocol and is supported by the majority of devices. It’s a good option to download and upload files, but we do not suggest you use this protocol if you want VPN to protect your connection because it is less secure. L2TP/IPSec is a 256-bit and RSA-2048 encryption protocol that is very robust but quite slow. Its main advantage is that this protocol can be used on the majority of mobile devices. OpenVPN is the most advanced one and comes with several options. OpenVPN 128-bit BF protocol uses 128-bit BF-CBC for data channel, RSA 2048 for keys and SHA1 HMAC. It is great for users who have devices that do not currently support AES/custom OpenVPN settings, e.g. Synology NAS. OpenVPN 128-bit AES uses 128-bit AES-CBC for data channel, RSA 4096 for keys and SHA256 HMAC. OpenVPN 256-bit utilizes 256-bit AES-CBC for data channel, RSA 4096 for keys and SHA512 HMAC. OpenVPN ECC utilizes 128-bit AES-CBC for data channel, Elliptic Curve using curve secp256k1 for keys and SHA512 HMAC. OpenVPN XOR uses 128-bit AES-CBC for data channel, RSA 4096 for keys and SHA512 HMAC. By making advanced technology, VPN.AC gives you unbreakable protection. It is the right option if you are looking for online security. VPN.AC provides global network which consists of dedicated premium servers with self-hosted DNS and gigabit bandwidth channels. It has over 80 servers across 20+ countries and the number of servers is increasing regularly to ensure against overuse of the provided locations. You can access network in US, UK, Singapore, Sweden, Romania, Poland, Netherlands, Mexico, Luxembourg, Lithuania, South Korea, Japan, Italy, Hong Kong, France, Finland, Spain, Germany, Switzerland, Canada, and Australia etc. There is no limit on switching between different servers. Switching servers never really produce a delay or freeze in the app’s performance. You are able to look at their server network bandwidth stats in real time and connect to the proper one for better performance. The provider offers free SecureProxy along with VPN servers. They run proxy servers in more countries for its encrypted proxy service than it does for its VPNs. 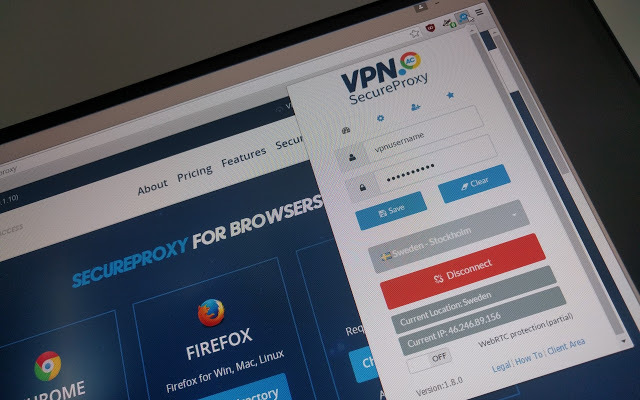 According to our test result, this VPN uses the HTTPS protocol to offer encryption of connection contents and deliver connections through a mediating server. In this way, you can fool the regional restrictions on streaming services and watch your favorite show from anywhere. Last year, the Congress voted to allow ISPs to sell users’ browsing histories without users’ permission. That means the strangers can purchase data about your online activities easily and legally. You need to take action to defend your privacy. VPN.AC hides your real IP address with a new one from different country or region. Like you are using a fake ID, but it’s not illegal. The high encryption technology also helps in protecting your identity from tracking services and preventing others from monitoring your activity. All traffic that passes through the VPN servers is encrypted and filled with a series of random requests which makes sure that there isn’t a pattern of activity for you and hence no one can determine what you are requesting what from what website. You do not leave any digital footprint are untraceable. VPN.AC also make great effort to ensure that there are no DNS leaks by using their own secure DNS resolvers. They generate millions of DNS queries per day. These DNS queries are mixed with legitimate queries from VPN users to make sure that potential monitoring of their DNS resolvers will be ineffective. The provider also supports Double Hop. This feature allows you to connect to two servers in different locations to prevent persistent individuals or organizations from tracking your real location. It is a further layer to your privacy protection. Besides, it is suggested to enable Internet kill switch. Though their servers are high in uptime, they still give you Internet kill switch in case the connection drops. When VPN drops for any reason, it cuts your connection to prevent the ISPs from viewing your activities. 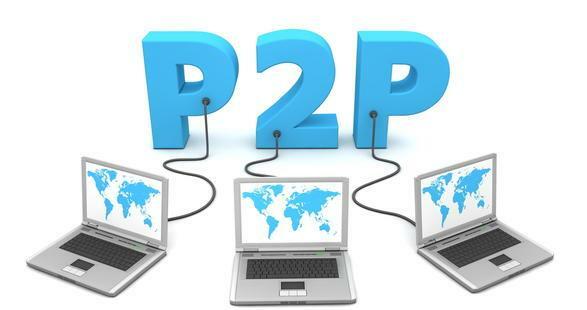 P2P is welcomed among Internet users while it is illegal in certain countries. Therefore, users are looking for a way to download anonymously. Due to copyright and law issue, many VPN providers do not support P2P/torrent. The good news is P2P/torrents are allowed by VPN.AC provider. This VPN has optimized servers for P2P downloading. It masks your IP address and encrypts your traffics, protecting your online ID. Others can’t track you and you won’t get caught. Lots of users pick it to keep them untraceable when downloading files off the Internet. Besides, this VPN assists you to bypass speed throttling applied by ISPs on some services such as media streaming. The provider does not oversell bandwidth, nor engage in volume-selling. All VPN nodes are connected to gigabit ports. You can download via P2P at superfast speed. VPN.AC is considered as the most effective way to bypass restriction based on geographical location. There are many contents are restricted in certain countries and regions. The media companies don’t want you to access their contents from other countries due to licensing fees, copyright agreements and libel and blasphemy laws issue. They decide your location according to your IP address and block your access if you are located outside their country. Netflix is generally the toughest in this league. It even blocks VPN access to ensure that only users in their country can enjoy the library of US videos. Many VPNs fail to work with it. Luckily, VPN.AC is still able to help you get around the regional restrictions of Netflix and BBC iPlayer. It offers outstanding servers and anonymous IP addresses to mask your connection. Your traffic will be diverted to a proxy server means that all requests to streaming servers will be presented on your behalf by the proxy. Thus, you will appear to be in the required country to get access to video content. If you would like to access Netflix, connect to server in the US. If you want to unblock BBC iPlayer, choose server in the UK. Is VPN.AC working in China? Yes, it is able to circumvent the Great Firewall of China which is most advanced one on the earth. If you live in China, you may notice that it is very difficult to access websites and services that are not based in China. When visiting foreign websites, the connection is very slow. What’s worse, millions of western websites are blocked by the firewall. Every time you are trying to access Google, Facebook, Instagram, WhatsApp or YouTube in China, the firewall disconnects you once it detects your China-based IP address. VPN.AC enables you to bypass Internet surveillance and mass-spying. It lets you connect to servers outside mainland China. Though the firewall blocks VPNs, VPN.AC uses advanced protocols and hides the VPN traffic into some others normal traffic, therefore it goes undetected by the most powerful firewall. It is one of the rare VPNs that haven’t blocked by the firewall. This is a great tool for users who are to trying access the Internet in Middle Eastern countries such as Iran, Saudi Arabia, and Pakistan, where controls on internet access are almost as difficult to defeat as those of China. VPN.AC offers free apps for Windows, Mac OS, iOS, and Android. The app is sleek, smooth, and it runs flawlessly, allowing you to change protocols, switch servers, tweak its settings, and even change its looks from the Dark to Light theme. It will keep running silently in the background once set up. Besides, its SecureProxy which comes with VPN subscription is implemented as a browser extension for Chrome, Firefox, and Opera. It provides strong encryption for all browsing activity using TLS. You are allowed to have the browser tunneling the traffic through VPN servers and all other traffic sent via your regular ISP connection. You can use local services at faster speed. The provider gives you an allowance of six simultaneous connections, so you can use this VPN to protect all of your devices with one single plan. It is very simple to install and set up VPN. You can get started with it easily. Manual setup for Linux, routers, and set-top boxes are offered. Simply follow the guide to install and set up VPNs. That can be done within minutes regardless of your computer knowledge. There are four ways to reach VPN.AC support, live chat, email, Skype and ticket submission. If you need technical/billing support, you are suggested to use the ticket system. To contact the support team, click on “Support” in the client area menu. Next, select “Open Ticket” from the drop-down menu. Alternatively, you can click on the “Open New Ticket” button in the client area main screen. In addition, there is a “Contact support” link in the app. This opens up a page in your default web browser to give access to the support center. The support agents have the required technical skills to assist you to resolve problem effectively. They also are friendly and patient when answering questions. Feel free to contact them. There are no support escalation wait times. You can talk directly to the infrastructure’s technicians. Besides, you can find many detailed guides in the knowledgeable dealing with a variety of topics, including OpenVPN, IPSec/L2TP, IKEv2, and PPTP encryption protocols, Router installation guides, Secure proxy and Socks5 proxy setup, Online privacy tips and Troubleshooting guides etc. You can find solutions to common problems that other users frequently have. VPN.AC company is based in Romania which is a great location for a VPN because laws there are friendly for privacy protection. The country’s High Court threw out the government’s data retention laws. Those laws were enacted under the compulsion of an EU directive. The result is that Romania does not impose the data retention and disclosure requirements that other EU nations impose. The provider will not be forced to log your connection and handle over your personal information. You can trust the provider and conduct private activities without any concern. By reading the VPN.AC review you must understand VPN.AC puts maximum concentration on the security and anonymity of the Internet users. It provides military grade encryption, good speeds, very secure apps, excellent performance and an excellent support system dedicated to helping users fix any issue. With it, you can cloak the user’s IP address and allow them to browse the Internet in anonymity. To keep you safe from the increased instances of cyberattacks worldwide, it secures your connection to the Internet with the highest encryption level. It is a useful tool to unblock geo-restricted content on streaming services such as Netflix, Hulu and BBC iPlayer. It also is an effective way to circumvent the Great Firewall of China, allowing you to access all banned services in the country with the heavy Internet restriction. VPN.AC also supports P2P, letting you download your favorite content from torrent websites securely and privately. Do you want to take back your privacy? Would you like to access all famous websites like Google YouTube, WhatsApp, Netflix and more services from anywhere? Are you seeking for online protection at less cost? VPN.AC is the useful tool that is faster, safer, better as well as a great service built by security professionals you need. Give it a try as it is risk-free for 7 days for all users. It is powerful and affordable tool. You can try the one month plan to test its service and then upgrade to yearly for long-term protection if you are satisfied with the reliable VPN service.